Welcome Aerial Lift Service Company of Sacramento, a new option for your Aerial Lift Service needs. Our company is comprised of some former employees of Horizon High Reach. Our primary sales, service and office staff includes Jim Lane, Cary Lane and Rick Sellers.. We are a locally owned and operated company based in the Sacramento Valley Region. Together our sales and service staff have over three decades of experience in the Aerial Lift Service Industry. Aerial Lift Service Company, we understand the needs of our customers in today's fast paced competitive market. That's why we, at Aerial Lift Service company are committed to providing our customers the highest standards of Customer Service in the Industry. We have a large inventory of high quality Aerial lifts, Forklifts, Boom Lifts, Man Lifts, Aluminum scaffolding and other equipment. We are dealers for Upright, Gradall, LiftKing and JLG. We have a very complete inventory of both new and used equipment. We also offer you the experience of our sales and service staff who will recognize your individual needs and provide you with the highest quality and best customer service in all of Northern California. When your company rents and/or purchases equipment from Aerial Lift Service Company, our Customer Service does not end there. Because we are locally owned and operated in Northern California we can provide you and your company with all your Aerial Lift service needs in a personal and timely fashion. We have radio dispatched delivery vehicles and a fully equipped Parts and Service department. You will find our sales, service and office staff is always on call and accessible to you Twenty Four/Seven. 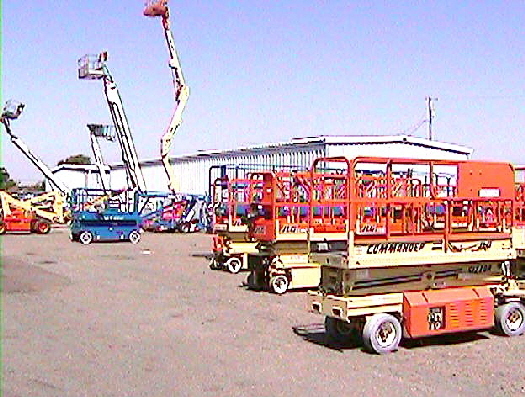 We are ready to take care of all your Aerial lift, Forklift, Boom Lift, Man Lift and Aluminum scaffolding requirements. In addition to our maintenance and repair service we also provide pick up and delivery of your company's equipment to and from job sites throughout Northern California. Aerial Lift Service Company is the first and last company you'll ever need for all your Aerial Lift needs in Northern California.